Olearia passerinoides is a mallee daisy and is quite a large bush with bright green leaves, different to many mallee daisies which often have grey green leaves. Although this is a shrub, to me it behaves as a perennial shrub, in that new growth appears along the older wood. The bush has a tendency to become scruffy, with the leaves higher up the stems and the flowers also high. If it was cut back to the lower growths, it would have dense foliage and be a more compact plant, and I suspect the flowering would also be quite spectacular. As usual, I promise myself that I will do this, and yet another season goes buy. Mine have just finished flowering, so out with the secateurs tomorrow, while I think of it. Olearia passerinoides is drought, lime and frost tolerant. 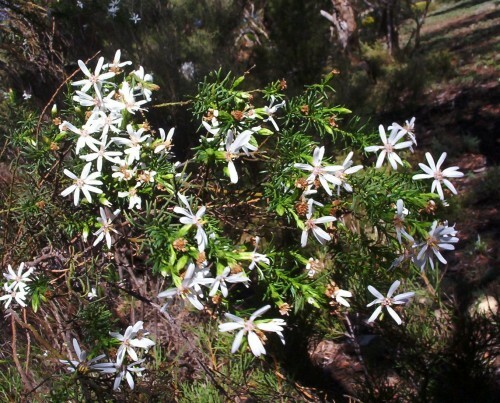 It has clusters of small white daisies and grows to 2-3m tall by about 1.5-2m wide if left to its own devices. Pruning will keep it to a more compact size.